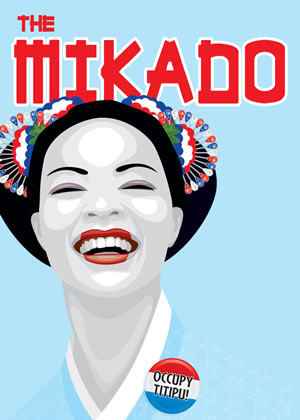 Lyric Stage Company of Boston will begin its 2012 - 2013 season with the Gilbert & Sullivan classic, "The Mikado." Directed by Lyric's Producing Artistic Director Spiro Veloudos, the witty musical satire of social mores and politics will run September 7 - October 13. Musical direction is by Jonathan Goldberg. Three little maids from school, a wandering minstrel, a pompous government official, and the Lord High Executioner are just some of the comically absurd characters in Gilbert & Sullivan’s most beloved work. Set in the fictional town of Titipu, "The Mikado" is a tale of the beautiful school girl Yum-Yum, engaged to be married to Ko-Ko despite her love for the romantic wandering minstrel, Nanki-Poo. Will these two young lovers find their happily-ever-after . . . or will heads roll? Blending some of the area's best talents in musical theater and opera, the cast features: Timothy John Smith as The Mikado; Davron S. Monroe as Nanki-Poo; Bob Jolly as Ko-Ko, Lord High Executioner; David Kravitz as Pooh-Bah; Rishi Basu as Pish-Tush; Erica Spyres as Yum-Yum; Teresa Winner Blume as Pitti-Sing; Stephanie Granade as Peep-Bo; and Leigh Barrett as Katisha. The ensemble includes Christina English, Joelle Kross, Kathryn McKellar, Brandon Milardo, Brian Richard Robinson and Matt Spano. For information and tickets, stop by the box office at 140 Clarendon Street just off Copley Square, call 617-585-5678 or visit lyricstage.com.